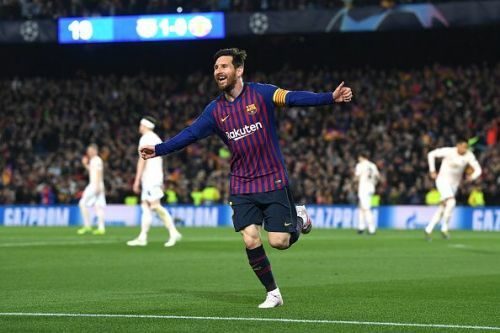 Barcelona beat Manchester United 3-0 at Nou Camp in the second leg of the quarterfinals of the UEFA Champions League. Lionel Messi scored twice in the span of five minutes, to kill any hopes that the Red Devils had, early in the first half. Phillipe Coutinho netted a curler in the 61st minute to make it harder for United. Ole Gunnar Solskjaer's Manchester United travelled to Spain, facing an uphill battle and were not up for it. United suffered their fourth consecutive loss against Barcelona in the Champions League, which includes the final losses in 2009 and 2011 and also the recent 1-0 loss at Old Trafford, thanks to an own goal from Luke Shaw. At the start of the match, United caught Barcelona by surprise and started brightly. However, as the Blaugrana dominated more possession, the United players failed to keep up no matter how hard they tried. A penalty was awarded when Rakitic fell down in the box but VAR rightly cancelled the call. Around the 16th minute, Ashley Young made a costly mistake as his failed attempt to clear the ball was intercepted by Messi in the final third. The Argentine was quick and smart enough to fend off Young's late desperate challenge to recover the ball. He dribbled past another defender to make space and finally, open the scoring for Barcelona. Messi struck again inside the next five minutes but this time, David de Gea was to be blamed after he failed to grab a simple shot from the 31-year-old. Messi also left Phil Jones in a lurch after his breathtaking run was too good for the defender. After the second goal, the tie was virtually over and Barcelona piled on the misery by dominating the proceedings in the second half. The Blaugrana captain now remains the top scorer of the Champions League this season followed by Robert Lewandowski. Messi also leads the race for European Golden Shoe with 33 league goals and ended in goal drought in the quarterfinals after numerous seasons. Here's how Twitter reacted to Messi's brilliant performance. Manchester United looked like causing trouble at the Camp Nou until Messi decided he was having none of it. The end. Messi has scored more goals against Manchester United than Manchester United have scored against Messi. Four to two. Bro Messi rolled up to the game wearing a Vegeta cap. Just a reminder that Lionel Messi finished 5th in the Ballon d’Or standings. All the 4 players who finished ahead of Messi are out of the semi finals of the Champions League.